It took some effort, but I finally learned how to understand, cope, and communicate with a person living with dementia. Here are 9 important lessons I learned on the path to Joyful caregiving. 1. I remember when I first learned that a person living with Alzheimer's is capable of more than we can imagine - I call this more there. A growing number of caregivers are learning - persons living with Alzheimer's and dementia often have hidden talents that can amaze. 2. I remember when I first realized something had to change. It was 1 o'clock in the morning on May 7, 2005. I know this because I wrote it down in my da Vinci pad. The pad I used all during my time of caring for Dotty to get new and better ideas. Basically, the ideas just jumped out of my brain, ran down my arm, into my hand, and ended up on the pad. All caregivers have to change. To adapt to the changing circumstances. Once they do, life goes on. And, sometimes in a most beautiful and wonderful way that is hard to imagine. 3. I remember thinking as part of our change we had to start living our life. We had to decide - drink the Alzheimer's Kool-aid, or live. We chose to live. And, it was at this point that we started doing and achieving. We just got out their and lived. It turned out that it was more beneficial to Dotty's health and well being that I could ever have imagined. 4. I soon learned that the more I changed the more Dotty changed. Dotty started living her life again. She didn't know she was living with Alzheimer's so why not just forget about it and move on with our lives. Hmm, sounds simple right? Well, once I started thinking of Dotty as deeply forgetful, I forgot she had Alzheimer's. No not every minute of every day. But, most of the time. And this allowed us to do, well, more than we could imagine. Which sound nicer, kinder, and less harsh? A person has Alzheimer's? Or, a person is deeply forgetful? Think about it. 5. When I started thinking of Dotty as deeply forgetful, I also started accepting her sometimes bizarre behaviors. You all know what I mean. Those behaviors that drive us crazy. Well, once I thought about Dotty as deeply forgetful, I also started accepting those behaviors as normal. They seemed natural for her. So I told my brain, relax these behaviors are normal for Dotty. My brain adapted quite nicely. If its normal, and you accept it, it can't drive you crazy. Thinking and feeling this way felt so much better, and much less burdensome. 6. Along the way, I learned that by instituting new patterns of behavior, a routine to our life, that many of the bad things went away. We were too busy living our life. Alzheimer's patients really like routine. A nice steady pattern to the day. So we got up, drank coffee, read the paper, went to the gym, had lunch, listened to music, went out into the bright light before sundown, got a phone call at night, and ate ice cream to top off the day. It worked quite nicely. And then, we started going out to places and around other people and it got even better. 7. It took a long time, but I finally learned how to understand, cope, and communicate with a person living with dementia. It was working so well that people asked me to write about it. So I did and the Alzheimer's Reading Room came into being. This is were I learned how many millions of wonderful caregivers there are in the world. To this day, I watch them come here and struggle; and then, they finally get it straight and go on to effective caring. 8. I learned how to think positive (relearned actually). Actually, the more positive I became, the easier it was to take care of Dotty. Don't get me wrong, I did not say its easy caring for someone living with dementia. I did say it became easier because I accepted that this was our life; and, I decided we would live it to the fullest degree possible. We did. 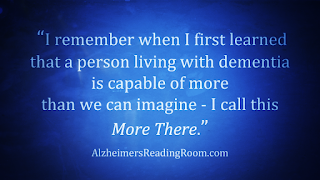 Alzheimer's Care - The Power of Purpose in Our Lives. I started to feel the Joy that comes with effective, loving caregiving. pretty soon you start to get the hang of it.